Hey there! I have GOOD news for you. 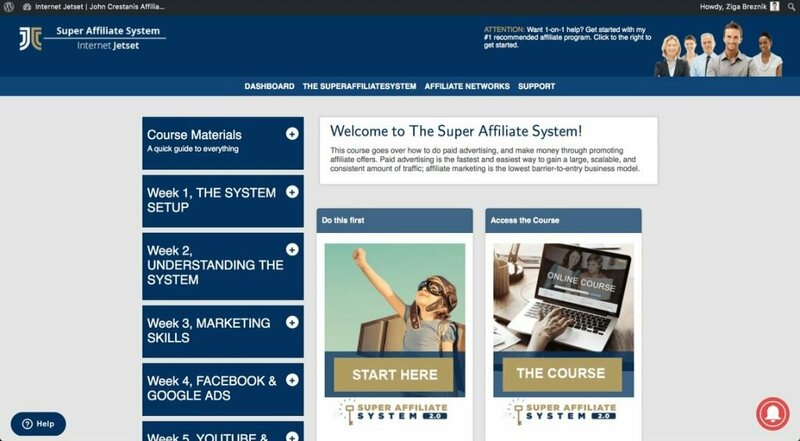 I went out and bought the Super Affiliate System, to show you guys what is on the inside and more importantly, if is it worth getting, this is my Super Affiliate System Review? Disclosure: Any results stated are not typical and only the most hard working and dedicated students that actually take action will be able to achieve life changing results! This is NOT a get rich-quick scheme or some marketing gimmick. It is about building a sustainable business online. Also, the opinions below are completely based on my own experience and should not be taken as any advice! If you decide to buy the course through the links, we receive a compensation, which enables us to keep the website running and try out other courses to give you these insights. First of, it is a 6 week course, that goes in depth into affiliate marketing and how to get started with building an online business with this model. The course is divided in 6 weeks, each week you will be focusing on a different topic. Off course you can go faster, but it is NOT advised to skip over any content. John Crestani has been in affiliate marketing business for about 10 years now and has spent a lot of money testing out different offers, ad networks, landing pages and tools. 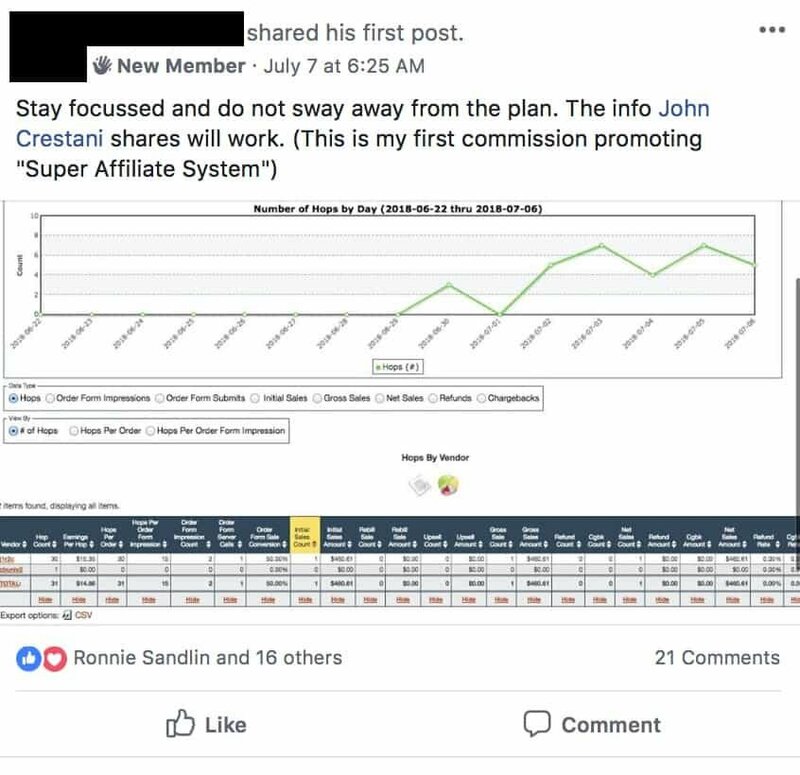 He is giving it all away in his SAS (Super Affiliate System Review). Of course I haven’t tested all of the swipes, images, offers, networks… But the ones that John provided me with brought in results. Now again, I have some experience with online marketing, but never really considered myself a PPC guy. I ran this offer through Facebook ads and managed to pull in impressive results! Ad spend was around $3,150 and the commissions rounded to about $4,200 which left me with a profit of around $1,000. Once I further optimize this campaign, it should bring in higher ROI. How Much Success Are Other People Having? I know, you might be thinking I faked the screenshot above (I don’t do that). But what I am about to show you, can’t be faked. 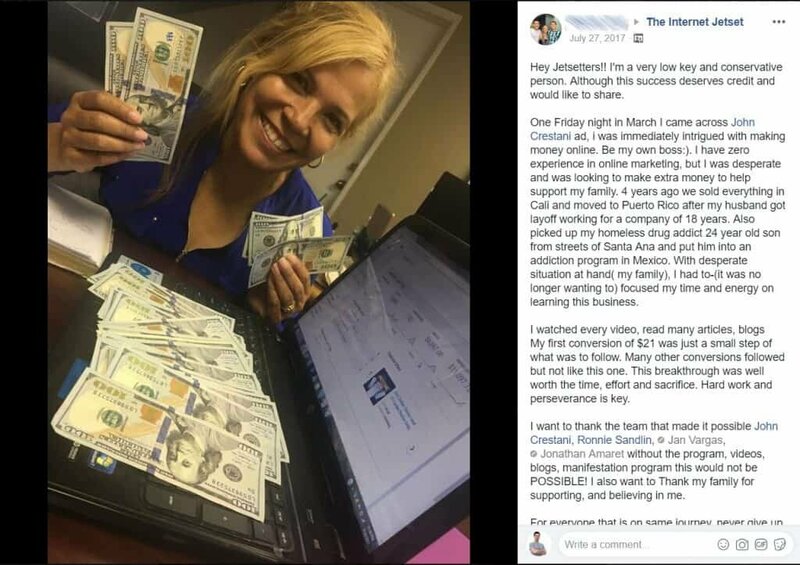 These are the results of everyday people, who got their start in affiliate marketing by learning from John. There are around 25 files of buyers targeting data available for download inside the members area. This is what made the Facebook campaign I ran profitable right away, however it took about $400 in testing to get the first sale. This is not for the faint-hearted as there is some testing budget required. However, I did a lot of mistakes that could be avoided if I followed the training better. In a nutshell, this data gives you access to the buyers in any niche covered in the training. It is not a sure-fire thing, however it is “as close as possible”. This is where this wonderful journey begins! Although not advised, one could skip this (I didn’t) if you feel like you know how to do all of this already. This is the module that you should NOT miss! Keeping the right mindset will enable you to ultimately succeed in whatever you are doing. The KEY sub-module is definitely the research part. John explains his process in great detail with MANY golden nuggets worth the price of the course! The key takeaway from week 3 is the John Crestani’s copy-writing formula. Learn how to talk to the “reptilian” part of the brain with some ninja psychology secrets. John’s 17-step copy-writing formula that works! “We Were Able To DOMINATE Facebook Ads And Take a Campaign to $1,200/Day” – Tyler E.
This is a whole different kind of beast. The amount of buyers you can reach with these networks is staggering. Getting your message (advertising) across to as many people as possible results in bigger pay-days! Setting up MGID Native Ads The Right Way! If you followed everything you should be able to have profitable campaigns up and running by week 6. But only by scaling and automating it is possible to make those 6-figure months a reality. Along with the 6 week course you are also getting weekly live trainings, where John is keeping you up to date on the latest industry news and goes over working campaigns. If you are looking to kick-start your online business and want to cut your learning curve, I think this is the best course to do so. Honestly, the amount of value and resources is just “off-the-hook”! I have never seen a course that goes so in-depth on every part of affiliate marketing. 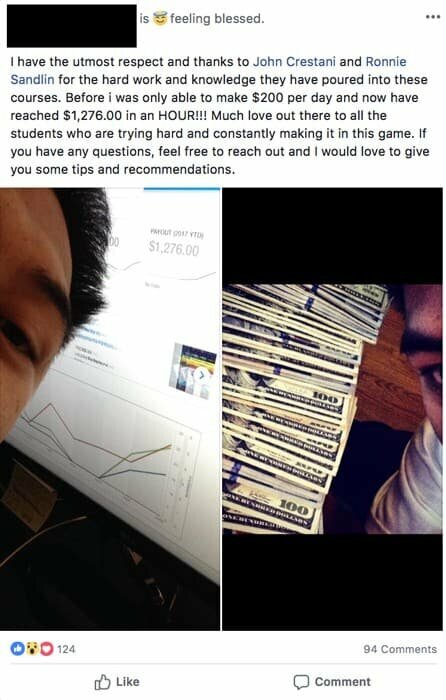 The reason why John is giving away so much is the fact that if you make money he makes money. It’s as simple as that. John Crestani is looking to start a shift in the online marketing community, where people guard their secrets and only release them at a high price, when the strategy is not working so well anymore. *UPDATE: The registration for the free training is closing soon, but we managed to twist John’s arm and get a special link backdoor link where you can still register. However, there are no guarantees it will still work when you are reading this! Hurry, before you miss your chance and doors close and you read the success stories after a few months, thinking: “I knew I should have joined”!